Every morning when I wake up I drag myself over to my laptop and methodically delete 150 emails that have come in overnight, advertisements and spam my junk filter didn?t catch. Then, just as methodically, I study 50 important emails about independent film projects at various stages of their hectic, insecure lives, and respond to every one. Except when I am traveling. The experience of travel throws me off my body-clock and game. I arrive in a distant city, schedule as compact as the clothes precisely rolled in my travel bag; I am somewhere else! I want to enjoy the people, take advantage of the place! I experience my new surroundings from morning ?til late night when, spent, I fall into the hotel bed. I yell at myself, inside my head, knowing the emails are piling up, until the yelling becomes white noise and I find myself awake the next day. Why was I in Helsinki? It was the week of?Love & Anarchy ? The Helsinki International Film Festival, and, embedded within it, the?Finnish Film Affair, three days devoted to movie industry professionals. For the Finnish Film Affair, I had put together a dream team of a panel: Mike Goodridge, CEO of Protagonist Pictures, the UK-based production, finance and sales company; Claudia Lewis, who served as President of Production for Fox Searchlight Pictures for 10 years; Laura Munsterhjelm, the talent agent and founder of Actors in Scandinavia agency; and Mike Runagall, Managing Director at Altitude Film Sales. We?d been asked to talk with Finnish film professionals about finding movie stories that travel. 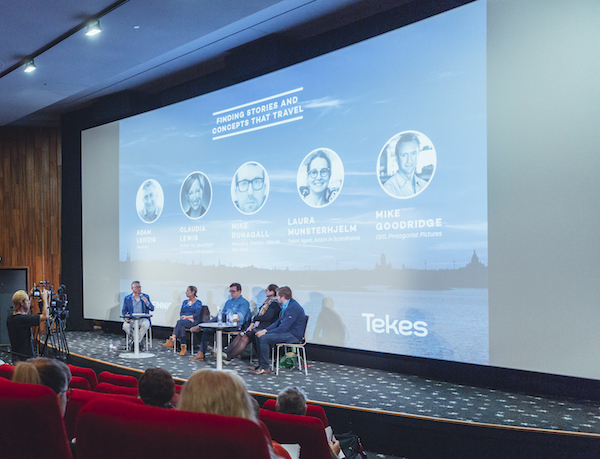 How could Finnish films go beyond the borders of Finland and find audiences around the world? The question, in fact, does not apply only to Finnish filmmakers. It is hard to get an accurate count of the number of films made each year ? I have heard estimates as high as 10,000 and more when Nollywood and Bollywood titles are added to the mix ? and few of them capture global audiences. By and large, worldwide audiences are the domain of big studio ventures, movies that come from comics, pre-aware titles, and well-traveled franchises. Only big studios can commit the marketing resources, often topping $200 million, to open a movie everywhere. Other than big studio movies, most film distributors are only interested in locally-produced product: Indian movies in India, Chinese movies in China. Few distributors anywhere showcase ?foreign-language films.? Could Finnish films travel better if they were made in English? In some cases the answer is yes, but I certainly would not want to see that happen at the expense of quality. During the festival, I had the pleasure of seeing?The Happiest Day in the Life of Olli M?ki,?directed by Juho Kuosmanen, which won the Un Certain Regard jury prize at the Cannes Film Festival and is Finland?s entry for the Oscar?s Best Foreign Language prize. ?Olli M?ki?tells the story of the lead-up to the 1962 world featherweight boxing match. No rational sales agent would have wanted the film if it had been pitched before it was made: It is in Finnish, a period piece, shot in black and white, about a person few outside Finland have ever heard of. But the resulting movie is a grand happy surprise, deftly made, funny and charming, authentic and true to itself. Made in English, the film would not have worked. Which brings me to the process by which Finnish film currently operates. If you want to make a movie, and you can do it for around 1.4 million Euros, and you can get a bit of money from the government?s cultural arm, as well as a commitment from Finland?s film distributor and broadcaster, you are done: You will have your costs covered. For the people who get their movies made, this creates a regular opportunity for work and creative output. Of course, there are limitations on the closed-loop of the Finnish system: budget limits, obviously, and also limits if you are not among the filmmakers blessed by official process. Therefore, the potential of expanding to audiences in other countries, as well as the game-change of a?filming financial incentive that will go into effect next year, will allow for a greater diversity of films and filmmaking talent. That will benefit everyone, and up-level even the filmmakers who stay within the existing system. Finnish filmmaking is quite accomplished, and is poised to expand and flourish in the next few years. Of that I?m certain. I?m also certain of one unintended consequence: Finnish filmmakers will have to deal with a whole lot more emails. Image from The Happiest Day in the Life of Olli M?ki, directed by Juho Kuosmanen.